Chicago Moms Blog: Chicago Moms Blog (and Silicon Valley Moms Blog) Contributors Party The Night Before BlogHer! 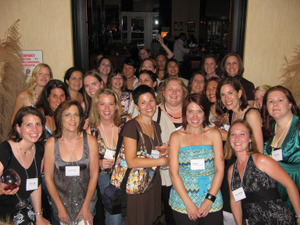 Chicago Moms Blog (and Silicon Valley Moms Blog) Contributors Party The Night Before BlogHer! Wow. This has been a wild 24 hours! Forty plus Chicago Moms Blog and Silicon Valley Moms Blog Contributors gathered at the oh-so -wanky and hip, Viand Restaurant to celebrate "The Night Before BlogHer" Party and finally get a chance to meet eachother in person! We promise to share more pictures and stories about the night, but we wanted to get this post up before we head over to the conference, today. A very warm thank you to Yahoo, who sponsored this party and to all the companies that donated items to our "swag bag", which all contributors of both sites will receive. Also, a HUGE thank you to Amy Mueller who was the swag bag depot/dropoff and production center. Without Amy, none of these swag bags would have been put together! Again, we promise to share more, shortly. Including more details on our swag bag and listing names on our Flickr photos. For now, here is the Flickr badge were we captured a bunch of photos from last night. Click below and enjoy viewing! BlogHer 07 Pre-party with Yahoo and the Silicon Valley & Chicago Moms Blog contributors. Make your own badge here.